A product of impeccable design by Edmonds + Lee Architects, this penthouse residence offers meticulous contemporary details and beautiful outlooks to the Golden Gate Bridge and beyond. 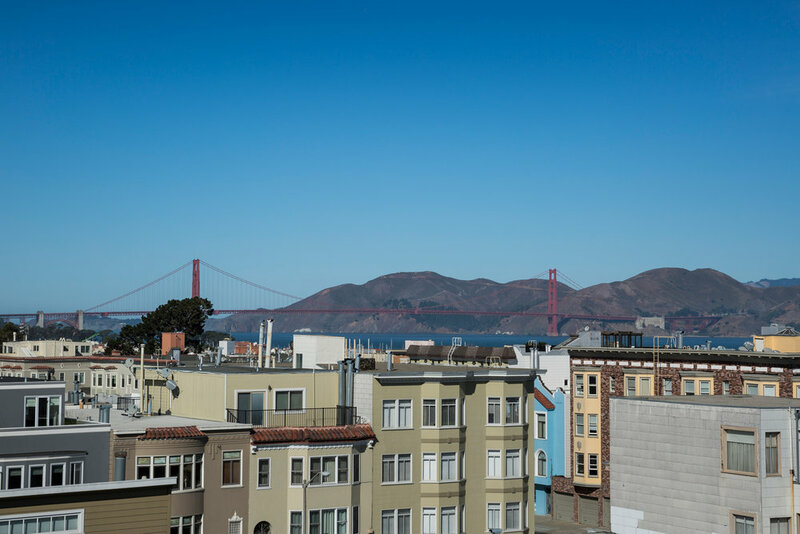 Constructed from the ground-up in 2013, 1456 Chestnut St residence #3 hosts three bedrooms, two bathrooms, and two private outdoor decks, including the panoramic roof deck. Details include hand-scraped wide-planked white oak flooring, radiant floor heating, and oversized floor-to-ceiling windows allowing for natural light to pour throughout the home. The entry hallway leads to a welcoming great room hosting a gourmet kitchen, open living and dining spaces, as well as direct access out to a private deck. The exquisitely designed kitchen is outfitted with an oversized peninsula, Miele appliances including a gas range, Silestone countertops, and great storage. The kitchen overlooks the entertainment spaces, which benefit from incredible views and natural light as well as direct access to the adjacent deck. A series of windows perfectly frames the Golden Gate Bridge, Palace of Fine Arts, and the Marin Headlands from the Great Room, featuring a dramatic gas fireplace. The living and dining spaces flow seamlessly into the outdoor deck, ideal for indoor and outdoor entertainment. The sumptuous master suite is drenched in southern light throughout the day and includes a luxurious ensuite bathroom. The master bathroom is appointed with a Victoria & Albert soaking tub, framless glass enclosed shower, travertine stone tiles, and dual sink vanity. The second bedroom has a floor-to-ceiling window and is adjacent to the second full bathroom. The bathroom has been elegantly designed with a wall-mounted vanity, frameless glass enclosed shower, and travertine tiles throughout. 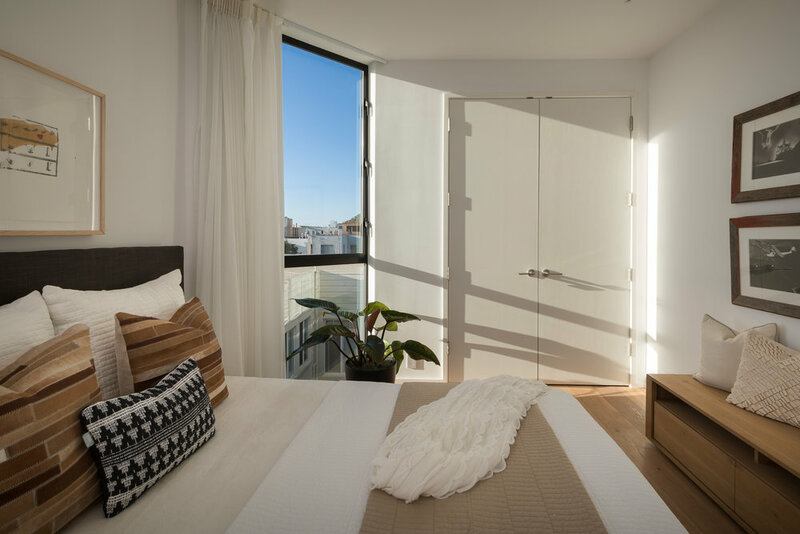 The third bedroom, which can easily function as a refined office space, enjoys a wall of windows as well as a glass wall, which combine to create a contemporary minimalist look. 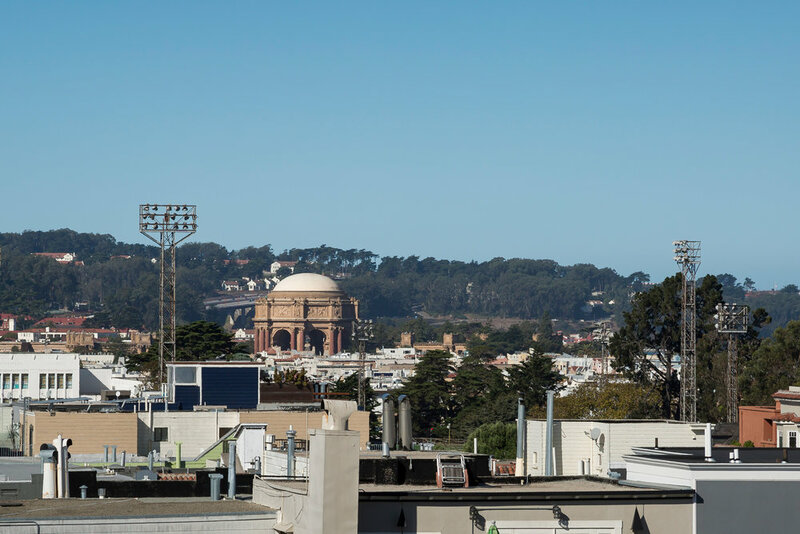 The top level of the home benefits from an expansive private roof deck with views spanning the Golden Gate Bridge, Palace of Fine Arts, Marin Headlands, Pacific Heights, and Russian Hill. The residence is located on the top floor of a boutique three-unit building, previously featured on the American Institute of Architects tour in 2013. The home affords access to a shared rear garden, two car parking in the garage, and additional storage. 1456 Chestnut St #3 is located on the eastern side of the Marina (not on landfill) and within close proximity to Fort Mason, Moscone Recreation Center, Aquatic Park, and the commercial corridors along Chestnut St and Union St.